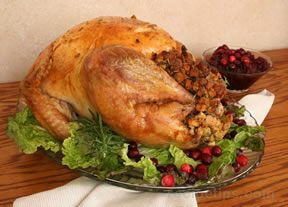 Wash turkey well and dry with paper towels. Salt and pepper the inside of turkey. Put celery, apple and onion inside the turkey. Tie the two legs together with string. Butter the top of the turkey. Place in a turkey size oven bag. Put in roasting pan. 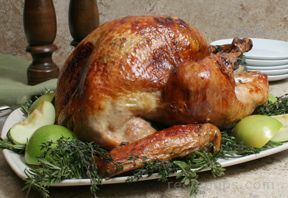 Bake according to the weight of the turkey, approximately 10 minutes per pound at 350° F.
When turkey is done, take out of oven put on a cookie sheet and let sit 15 minutes or until you can handle the turkey to slice. Place sliced pieces in a pan that will hold the whole turkey or in smaller containers. Pour the turkey broth over the sliced turkey. Cover tightly and freeze. When ready to use, take out of freezer and bake until hot. This can be baked and frozen months ahead of time. NOTE: If you don't have enough broth, you can use chicken broth. 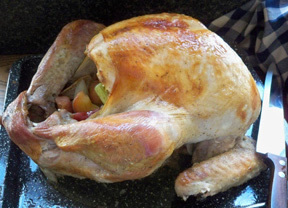 "I cooked my turkey for Christmas Eve using this recipe. It turned out great. I hope it is as good and moist when I take it out of the freezer as when I put it in there. 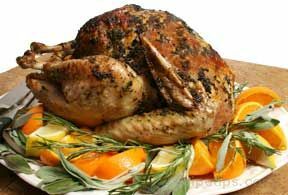 Cooking my turkey ahead of time will make Christmas Eve day a lot less stressful." "This made the Thanksgiving meal rush so much more enjoyable. No need to get the carving knife out and have the mess around. We were ready to eat when everyone came in. And it was juicy!"